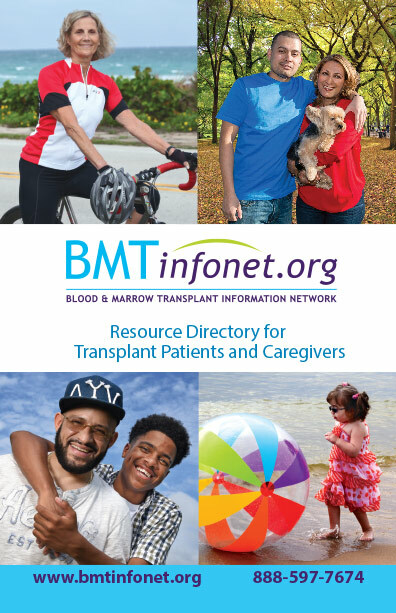 Quickly find organizations that can provide you with information about transplant, emotional support and financial help. Bone Marrow, Stem Cell and Cord Blood Transplants: Get the facts and help you need! Developed with the help of dieticians, this brochure offers tips on how to manage eating difficulties that are common after transplant. Practical tips for managing the emotional and physical challenges of caring for a transplant patient. Learn about BMT InfoNet's one-on-one peer support program: Caring Connections. Spanish Rack Card: Describes the publications and services available from BMT InfoNet. Spanish Rack Card: Tips on how to manage eating difficulties that are common after transplant. Spanish Rack Card: Providing tips on caring for a transplant patient. Tarjeta Consejos Utiles para los Cuidadores.